Today I’m over on the New York Times website. They have a column called Room For Debate where they ask a question and get a few people to weigh in with different perspectives. They recently reached out to me to give my thoughts on how user experience and design could help deter drivers could be from texting and driving. I originally wrote about text and driving in this 2013 post on Medium. But my article in the New York Times shares updated thoughts I have on some new apps and design ideas. Mobile phones have become so integral to society, it is not fully effective to rely on people to have the self-discipline to not use their devices without a true incentive to do otherwise. I’m thrilled that design can play a role in helping solve problems that matter, such as this one! When I was writing the article, I stumbled upon a very cool app called Lifesaver, that aims to help reduce texting and driving. Here’s how Lifesaver works … once the app is installed on a phone, the app will cause the phone to automatically become locked once it detects a car is in motion (because the phone can detect speed). Once the phone is locked, there is an option to unlock it in case of emergency (or in the event that you aren’t in car, but in a bus or train). Lifesaver is more than an app though. At the core, it is a means of introducing accountability, which can greatly influence people’s behaviors. One big use case is for parents to have their children install the app. Parents can also access a dashboard to show all activity. So if a child is the driver and unlocks the phone, the parent will see the unlock activity and be able to question the child about it. I spoke with the co-founder Ted Chen last week and was really impressed with their focus on helping people change their behavior through the marriage of technology and accountability. Distracted driving is a growing problem that we cannot ignore. 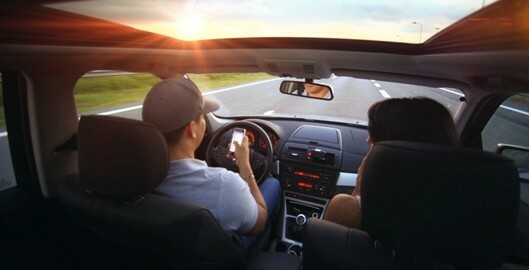 It’s not just about texting – it’s about general usage of mobile devices while driving. In fact, an 18 year-old girl from Georgia was using Snapchat when crashed her father’s Mercedes at 107 miles per hour and caused a man permanent brain damage. To compound the terrifying nature of this story, a girl who was a passenger in the Mercedes was pregnant.